My mantle is lined with homemade wood toys — dogs and cats driving brightly-colored cars, tractors and even pulling Santa’s sleigh. A retired gentleman in Darlington, SC lovingly crafted these special toys in his backyard wood shop, selling them to raise money for the local animal shelter. When I learned that he was close to donating $1000 to the shelter, I bought enough toys to help him reach his goal. That was my first experience buying art (these toys go beyond “crafts”) to support animal rescue. Fort Worth Abandoned Animal Alliance (FWAAA). 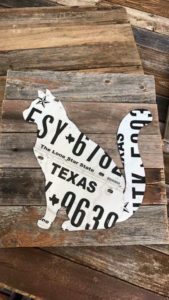 Volunteers sell license plate art (dogs and cats) to raise money for their organization, whose goal is to give adoptable animals at the Fort Worth Animal Care & Control shelter more exposure for adoption or rescue. They sell the license plate cutouts at events, but I’m sure they’d be willing to send you one. Contact FWAAA via their Facebook page. (artistsforanimalstx.org). Co-founders photographer Teresa Berg and Dallas Symphony Orchestra’s Principal Oboe Erin Hannigan combine their talents with many other artists, sculptors, musicians, writers and animal lovers to raise money for North Texas animal rescue charities. Teresa Berg also donates her time and talent by photographing rescue dogs, increasing their chances of being adopted. She’s taken gorgeous pictures of my foster dogs, making even my black-with-black-face pup look like a super model. Since its inception in 2011, Artists for Animals has donated more than $150,000 to rescue groups! How can you help? Vote for your favorite pup (they’re not all tiny!) to be featured in the 2019 Tiny Dog Calendar. Twenty-eight contestants are vying for coveted spots in the annual calendar. Each vote is $1, and 100 percent of the proceeds go to the Artists for Animals Grant Fund, which fulfills grants each year to carefully selected animal rescue groups in our area. Voting runs through midnight on Sept. 1. Here’s where to cast your vote for your favorite pooch(es): https://squareup.com/store/artists-for-animals. Support Artists for Animals by attending Mozart in the Sky, a fundraiser concert on Sept. 9 featuring Trio Kavanah (https://artistsforanimalstx.com/2018/08/18/artists-for-animals-concert-alert/ ). Paint and wine classes. Several local studios (including Painting with a Twist and Pinot’s Palette) host painting class/wine drinking parties (they may be BYOB) for local animal rescue groups. In some classes, you bring a photo of your favorite pet and leave with a painting that may or may not resemble said pet, depending on your talent and how much wine you’ve imbibed. You’re sure to have fun whether or not your creation is display-worthy. Keep an eye on dallasdoglife.com and Dog About Town for painting parties that support local rescue groups. Committed to giving back to their local communities, Painting with a Twist sponsors monthly fund-raising events — Painting with a Purpose. Painting with a Twist has donated more than four million dollars to local non-profit organizations such as Habitat for Humanity, Multiple Sclerosis and Odyssey House. On Sept. 9, the Mansfield studio is hosting a fundraiser for Mission: Wolf (a wolf sanctuary in Colorado). Professional photography sessions. Many photographers donate their services to support local rescue groups. The Coppell Humane Society requests donations for professional photos taken by Penny Whistle Photography at the Coppell Farmers’ Market around photo-backdrop-worthy holidays. Last year, Ana Banana (my foster dog) posed for gorgeous Halloween photos. In Mid-November, Santa and Grinch dog photo sessions start cropping up, benefitting local rescue groups. Check dallasdoglife.com and Dog About Town (The Dallas Morning News) for photo opportunities. Dalmatian Rescue of North Texas (DRNT) has a fabulous Dalmatian-loving photographer (John Sealander), who’s taken amazing Santa pics of my personal dogs for the past five years (I contact DRNT in mid-November so I can put the photo shoot on my calendar). Animal Allies of Texas also has an outstanding Santa and photographer, and Three Dog Bakery often hosts Grinch photos. Crafts for Paws (craftsforpaws.com). A dedicated group of animal lovers are making a difference in a creative way! Crafts for Paws donates 100 percent of the proceeds from the sales of stamps to help DFW-area homeless dogs, particularly those with expensive medical needs. In addition to sponsoring medical treatment for dogs in need, Crafts for Paws donates money to two animal sanctuaries that provide long-term care for elderly or hospice dogs. Whether you like creating art or just appreciate the finished product, you can support homeless animals in the process. Silent auctions at fundraiser parties often feature animal art and/or photography sessions. One year I won a portrait of my dogs, painted on the pages of an open hardback book. I treasure these artistic keepsakes of my beloved fur-babies.